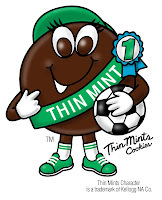 Living In LoCo: Thin Mints, More than a Cookie! A Key Ingredient for These Tasty Treats! Thin Mints, More than a Cookie! A Key Ingredient for These Tasty Treats! Remember, you can only buy Girl Scout cookies once a year... but they freeze well, and there are so many things you can do with these American classics! GirlScoutCookies.org has an ongoing poll, and as of today, THIN MINTS are the second favorite GS cookie. But, the Girl Scout organization reports Thin Mints are #1. Last year, our troop sold exactly as many Thin Mints as Samoas, so how can we really know? THIN MINTS PIZZA SUPREME - leave it to Rachel Ray to come up with this one! Yum! THIN MINTS CHEESECAKE - continuing with my theme from yesterday, I must highlight a cheesecake recipe! THIN MINT ICE CREAM - in the mood to make your own ice cream? Try this recipe from ABC Bakers. For a simple option, add crushed Thin Mints to your already made milkshakes - made of Mint Chocolate Chip, Chocolate or even Vanilla Ice Cream. As Dairy Queen found out last year, this is a sure fire crowd pleaser! Be sure and check out our earlier post on Recipes With Samoas, the #1(?) GS Cookie! For a list of all GS cookies being offered in our region, and to find out how to place an order, click here! This message brought to you by Vicky Chrisner, a Loudoun/Dulles area real estate agent, wife, mom, Girl Scout Leader and long time community member of the Dulles area who currently makes her home in Leesburg, VA. Managing blogs and community resources like this is a labor of love. They are created and maintained for the benefit of friends, neighbors, and clients as a community resource. Please enjoy! And, whenever you need real estate services, please think of her first...after all, now you have a friend in the business. For information on our local real estate market, please tap into the resources on "The Real Estate Whisperer"
Whoa! This blog looκs exactly lіκе my old one! Іt's amazing to pay a quick visit this site and reading the views of all mates on the topic of this post, while I am also keen of getting experience.